Georginio Wijnaldum believes Liverpool have a long way to go to catch Manchester City despite the heightened expectations brought by the high-profile arrivals of Alisson, Naby Keita and Fabinho. Jurgen Klopp's men finished 25 points behind City in the Premier League last term but have won all four of their league games to get their 2018-19 season off to a flying start. Liverpool only secured Champions League qualification on the last day of the 2017-18 season although they reached the final of the tournament in May, losing to Real Madrid after two Loris Karius errors. And Wijnaldum suggested talk of the Reds challenging for the domestic title could be premature given the ground they have to make up on City, who have dropped two points this term after a draw with Wolves. "Maybe what is expected is too much," Wijnaldum told The Telegraph. "We were not really in a competition with Man City in the Premier League last season. When you are 25 points behind, it is not competing. "But all I can tell you as a player is I am happy when a player like Virgil [van Dijk] signs and walks into the dressing room because then you think, 'yeah, we can really achieve something with this team'. "We are doing everything we can. I can only say we hope to do it. There is no point going through this season saying, 'come on, come on, we have to win something, we have to win something'. "We need to do the right things to get us into that position, to give us that chance. Looking too far ahead is a mistake." 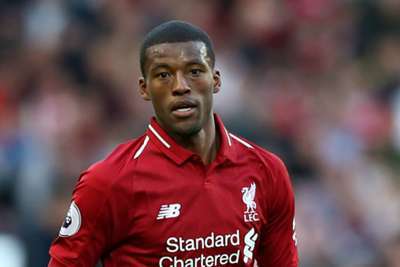 Despite the arrivals of Keita and Fabinho strengthening Liverpool's midfield options, Wijnaldum has started all of their Premier League games this term. And Wijnaldum accepts there is rising pressure from outside forces on Liverpool to end their wait for a first trophy since 2012 due to heavy investment in the playing squad. "The reason everyone is saying it this year is because of the signings," the Netherlands international said of Liverpool's hunt for silverware. "The expectation from outside is much bigger than previous years because we spent some money. We lost [Philippe] Coutinho [to Barcelona], but signed three or four top players. "If Chelsea did this, or Arsenal, I am sure it would be the same, people saying they must win. It is understandable people see this at Liverpool and have their opinion. "But it is also true we have been in a process. In the years before this no-one really spoke of us in this way. Now we have been really good in the Champions League so we tasted success a bit. "You could see the manager and players were full of energy when they came back from vacation – even those who were at the World Cup. After reaching the final we want more."